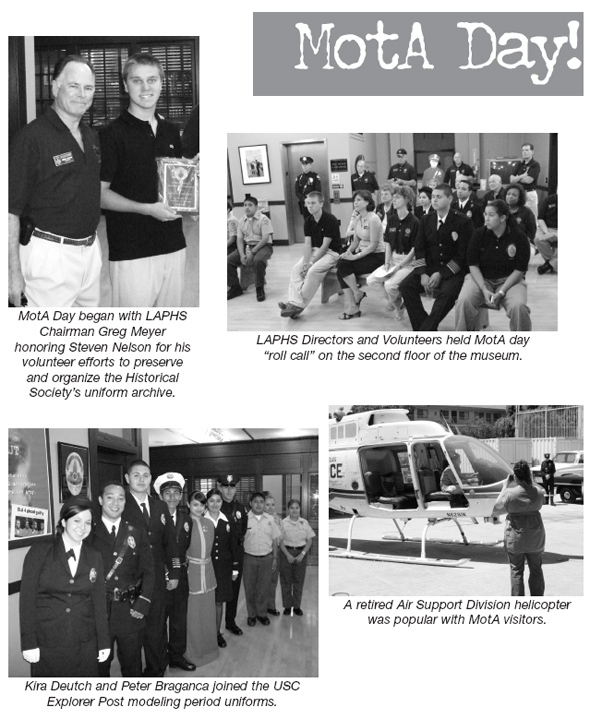 This will be a year heavily populated with special events involving the Los Angeles Police Historical Society. The Chief’s Circle luncheon, Board of Directors retreat, LA Confidential screening and the Museums of the Arroyo day have already entered into the history books. Still to come is the first Museum Run (read more about this inside), some exhibit unveilings, and the most significant event of any year, the Jack Webb Awards. This year marks the fifteenth time the Historical Society has formally recognized persons who have shown a sustaining commitment to law enforcement. 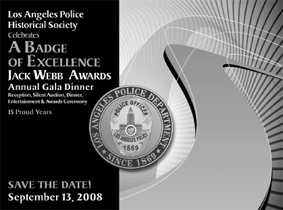 This year’s award recipients have all supported this profession and the Los Angeles Police Department in many ways and on many occasions. District Attorney Steve Cooley, a former LAPD Reserve Officer, has a lengthy record of service to polici n g in general and the Department in particular. Jay Grodin, a prominent attorney and former FBI agent, is also a long-time supporter of the Department, most notably as a legal advisor during the administration of Chief Daryl Gates. Kerry Morrison, the Executive Director of the Hollywood Entertainment District, has been involved with the Department on a number of level s . Besides the great work she has done in revitalizing a critical area of the City, Kerry is deeply involved with the PALS program at Hollywood station. Each of these people is deserving of the recognition that we will bestow at the September 13, 2008 ceremony which will feature bestselling author James Ellroy as the master of ceremonies. We hope you will join us in the grand ballroom of the Sheraton Universal for this great evening. advancement. New exhibits will come on-line in short order. The restoration of a historic vehicle is nearly complete, and we have two notable preservation projects under way. One of them, our photo digitization effort, recently yielded results directly related to our Jack Webb dinner. A number of pictures of Jack Webb were recently returned to us from the digital imaging firm. 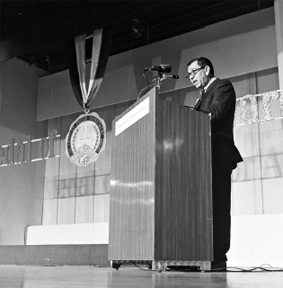 We share this photo, of Jack Webb hosting the Medal of Valor awards, in recognition of his role as a true supporter of the LAPD. Central to police work here in Los Angeles are two functions — protecting and serving. These activities are so representative of the LAPD, they are the sole contents of the Department motto. Some time ago, we took a little license with the motto and adapted it for museum use: “To Collect and Preserve.” This was done simply because these two functions are essential to museum work. So much so that we have been extremely busy doing just this, collecting and preserving. We’ve also been busy with an offshoot of this, exhibiting. In very short order we expect to unveil the Boeckmann Gallery of the Los Angeles Police Commission. This project has been in the works for some time, and the final touches are currently being applied. Throughout the years, the police commission has woven its own unique history. Part of this history can be attributed to the many fascinating chapters of LA’s own history. 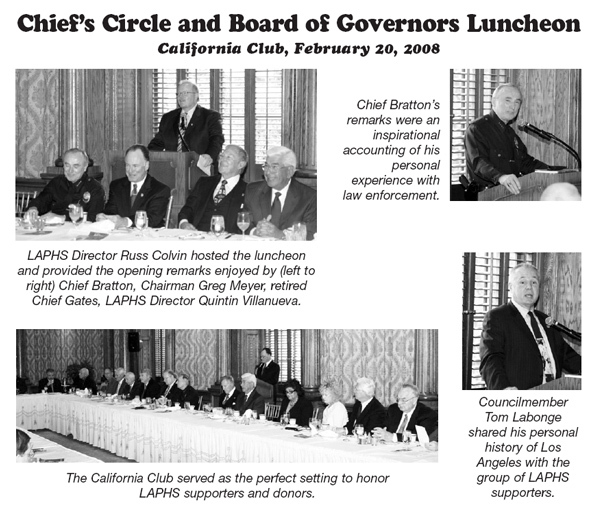 Yet another part has to do with the many and varied roles the commission plays in the governance of the LAPD. The exhibit showcases some of these many functions. Former Commission President Bert Boeckmann, a longtime LAPM and LAPD supporter, has made this exhibit possible and we look forward to opening the gallery to the public soon. When the Boeckmann gallery opens, some of our preservation efforts will be in evidence. As we were assembling the contents of one of the displays, the need arose for a photograph that depicted an officer with a Department shotgun. As it turned out we had just received the preliminary results of our photographic negative preservation process. 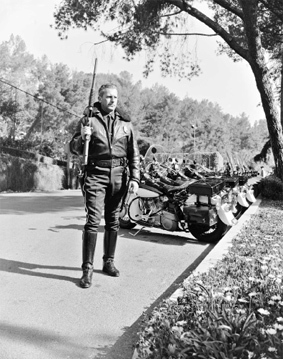 Contained within the first batch of digital files was a photo of a motor officer carrying a shotgun. A perfect of example of our need to collect and preserve — and exhibit. So, this photo will be on display in the Boeckmann gallery. Although we have this great photograph preserved for the coming generations, we don’t have the officer’s identity. Anyone who might know this, please call or e-mail us. As work began to wind down on the commission gallery, we turned our efforts to another existing exhibit. For some years, our uniform gallery was displayed in a second-floor office area. The uniforms were some distance from visitors, often preventing them from enjoying an upclose inspection of our historical finery. The gallery was recently re-worked with an eye towards enhancing the path through the second floor and reducing the distance between visitor and history. Construction has moved along steadily and we expect to deliver a greatly improved and well-presented uniform gallery in the very near future. We have another former police commissioner, Marguerite “Mama J” Justice to thank for this exhibit. It was her generosity that made this exhibit possible. Even though all of this activity is swirling about the museum, we took time to participate in a couple of notable events. During police memorial week, the Historical Society assisted with a commemoration of the 100 year anniversary of the loss of Captain and former Chief of Police Walter Auble. We were also there to support the Memorial Foundation at the annual Police-Celebrity Golf tournament. The Historical Society was also present for the Valley Traffic event and the bomb squad’s open house at their new facility. Each of these was wonderful in its own right, and right in the midst of all these great happenings was the museum’s busiest day of the year, the annual Museums of the Arroyo day. Hundreds of visitors stopped in to enjoy the museum in its soon-to-be-changed state. Again this year, we were able to provide free refreshments to the museum-goers. All of this was possible because of some great assistance from our volunteers, directors and the Explorer post at the USC Department of Public Safety. Those we thank include Gustie Bell, Dallas and Judy Binger, Joe Bonino, Peter Braganca, Dave Brooks, Keith and Jake Bushey, Denis Cremins, Kira Deutch, Sandra Dyson, Carl Frank, Steve Getzoff, Tom Hays, John Incontro, Brian Johnson, Greg Meyer, Joel Montes de Oca, Valerie Nelson, Margie Regan, Keith Ricks, Angie Roman, Tracey Schuster, John Thomas, Don Vincent, Lorena Walsh, Peggy York, Officer Michelle Velasco (USC Public Safety) and Explorer post 2122. One of the visitors that could not join us on Museums of the Arroyo day, dropped in with Deputy Chief Terry Hara during early May. His was a story we visited in an earlier edition of the Hot Sheet, and HBO visited in their series Band of Brothers. 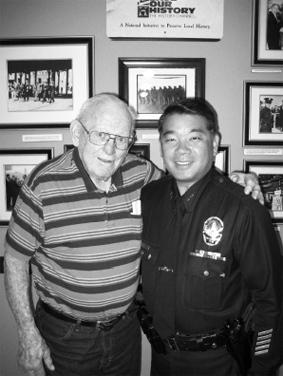 Buck Compton was in town to be honored at his alma mater, UCLA and we were honored to host him here at the museum followed by a most informative lunch discussion at the Police Academy. The history associated with this single individual is most remarkable, and now told in his new book, Call of Duty: My Life Before, During and After the Band of Brothers. These have been busy times, devoted to collecting, preserving, exhibiting, and one other pursuit, planning. We are planning our first benefit motorcycle ride for July 19, just a short time away. Complete information on the event can be found elsewhere in this newsletter. In the event more information is needed phone us at (323) 344-9445. As with Museums of the Arroyo day, we will need some volunteer assistance, and if you would like to help us with the great day, please let us know. We will gladly fit you into our Great ‘08. LAPM Director, Deputy Chief Terry Hara, hosted Buck Compton at a recent visit to the museum. Buck’s personal history includes service as one of the “Band of Brothers,” All- American catcher at UCLA, prosecutor of Sirhan, Sirhan and retired Appellate Court Justice.